WELCOMING SIGN at median between First and Third streets greets visitors to Larchmont. Architect and Windsor Square resident Douglas Meyer recounts the history of Larchmont’s first median, between First and Third streets. 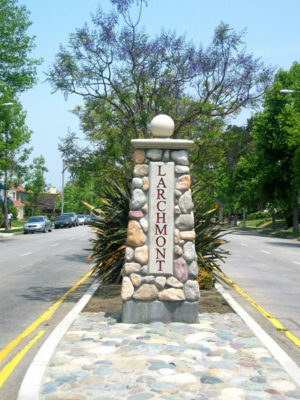 The Larchmont median is and was a community project. The median was envisioned by Windsor Square resident Linda McKnight and myself, endorsed by the Windsor Square Association (WSA), and came to fruition with countless hours of work and the help of many, including Norman Murdoch and Carolyn Ramsay. I spearheaded the project for the WSA board and, as an architect and planner, I developed the initial design and worked with the city (Bureau of Street Services) to implement the entryway. We used design boards as a visual aid to “sell the project” to the neighborhood. We conducted focus groups as well as met with various city agencies. When it became clear that lack of city funds would likely cause the project to become mired down in bureaucracy, local families stepped forward to advance the project. With the assistance of Councilman John Ferraro’s office, private funding donated by Windsor Square and Hancock Park families was matched by a grant from the Metropolitan Transit Authority. In the end, the landscaped median was truly a private/public effort. Through this extraordinary community effort, we now have a landscaped gateway to Larchmont Village. It is important to acknowledge that the landscaped median was initiated by residents, conceptualized and funded by residents and the MTA, and is maintained through donations by local families.